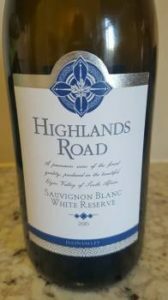 Elgin property Highlands Road, which has a high reputation for its Sauvignon Blanc-Semillon blend called Sine Cera, recently released an ultra-premium single-variety Sauvignon Blanc. From the 2015 vintage, it was tank fermented and then had 22 months on its primary lees in fourth-fill French oak. It was originally aged in order to go into the 2016 Sine Cera, but when owner Michael White tasted it during blending trials, he decided to bottle it separately. The nose is redolent of white flowers, blackcurrant, peach and apple while the palate has lovely purity and weight making for coated acidity, a hint of white pepper on the finish adding interest. Not cheap at R295 a bottle but this is one for the aficionados as it comes across as an extraordinarily focused and singular wine.